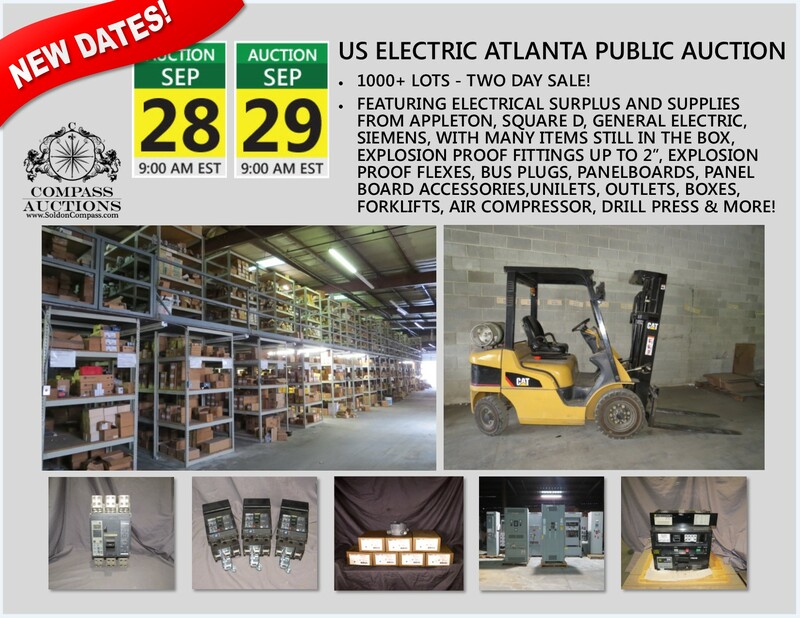 ATLANTA, Sept. 22, 2017 /PRNewswire/ — Atlanta-based electrical wholesaler U.S. Electrical Supply is closing its doors after more than 30 years and selling its remaining inventory in a two-day auction set for September 28-29. Compass Auctions and Real Estate will conduct the auction, which features more than 1,100 lots over the two days. “We expect this to attract a lot of electrical contractors, individual electricians, retailers, builders and others, who will see it as an opportunity to build up their inventory of electrical supplies they are constantly needing,” said Paige Holt, president of the auction company. “Because the business is closing, we’ll be selling not only the electrical supplies, but forklifts, racking, scissor lifts and other assets used for managing the warehouse as well,” she said. More than 30,000 unique items will be sold, including circuit breakers, transformers, conduits, conduit fittings, bus plugs, panel switches, combination starters, termination kits, junction boxes, unilets, lights, switches, fuses and other items. Brand names include Appleton, Square D, General Electric, Siemens and many others. “U.S. Electric has been the only surplus dealer in the Atlanta area selling construction grade electrical apparatus. So there may be some items in this auction that will be more difficult to find before long,” said Holt. The live onsite with webcast auction will begin at 9 a.m. Eastern each of the two days — Thursday, Sept. 28, and Friday, Sept. 29, at 915 Glenwood Avenue Southeast, Atlanta, 30316. The items are available for inspection from 8 a.m. to 4 p.m. Monday, September 25, through Wednesday, September 27, or by appointment. Online prebidding is under way at soldoncompass.com. US Electrical Supply in Atlanta to close after 31 years. 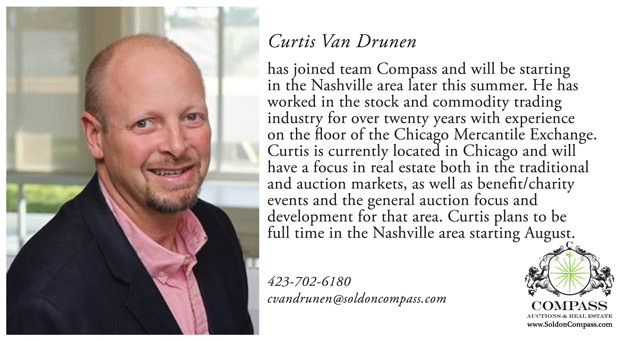 Compass Auctions to handle auction services. 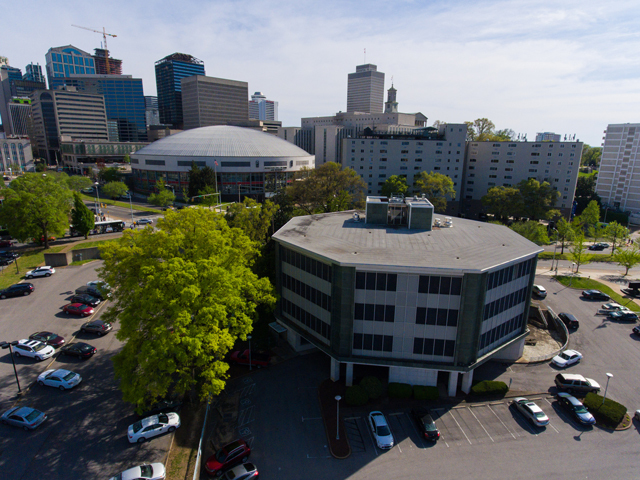 A Chattanooga-based auction company said today it sold two state properties in downtown Nashville for $8,925,000. Compass Auctions and Real Estate, which conducted the sale, said 30 parties registered for the auction. The winning bidder will remain confidential until after closing on or before Aug. 7. 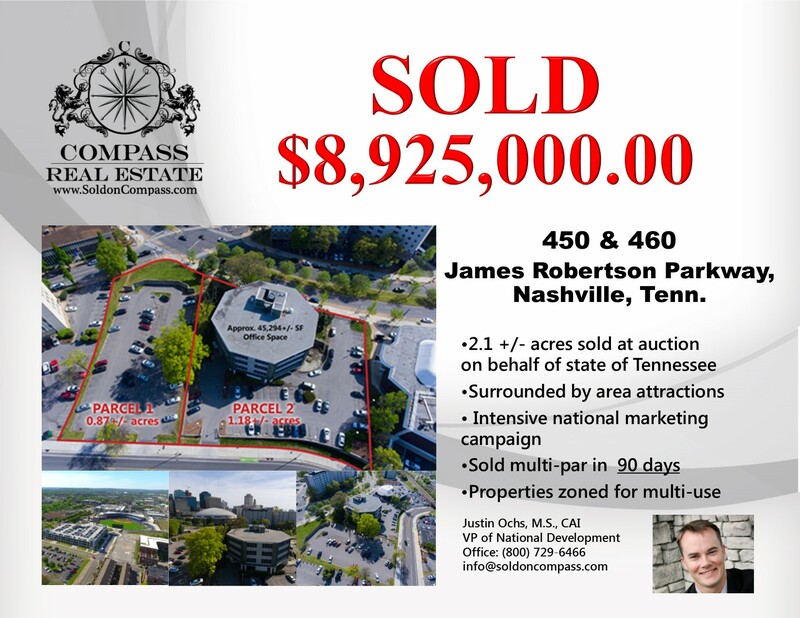 Paige Holt, president of Compass Auctions & Real Estate, said the Nashville market attracted a lot of interest. “Real estate in this market is in high demand, and a property of this size is a rare opportunity,” she said. 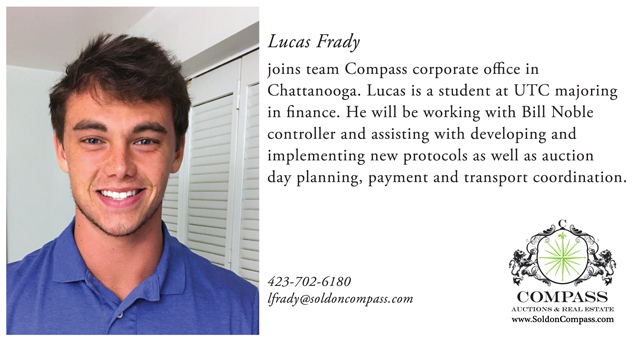 Team Compass is happy to announce the addition of Brittany Hurdle, Curtis Van Drunen, Lucas Frady and Kali Holt. 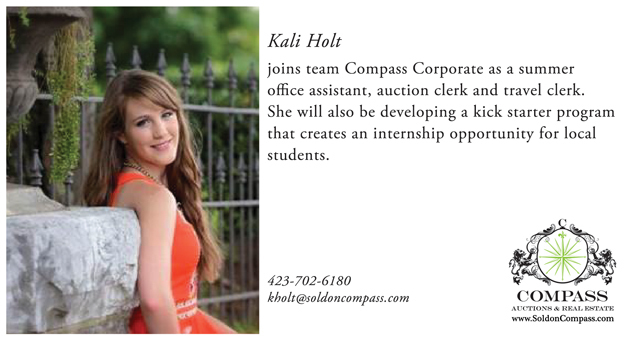 We are excited to have them on board and help Compass Auctions & Real Estate be of service to you or your business! Visit these links to learn more about how Compass can serve your real estate or auction needs. Alexzandra Geyerman knows that greatness doesn’t always come from following a common path. She believes that success tags right along behind choosing happiness every day and knowing when to bend the rules. Entrepreneurialism runs in her family. Her great-great-great grandfather founded the first Geyerman’s General Mercantile in 1852 and from age 13, Alexz spent her weekends sorting hangers and folding Alfred Dunner slacks at the Mitchell, SD store 150 years later. She remembers the old, tattered lion poster hanging above the staircase leading to the employee break room – “The customer is always king”. That Midwest mindset survived six generations, and remains the groundwork for each venture Geyerman encounters. Before graduating with an Audio Engineering degree from The Institute of Production and Recording in Minneapolis, Alexz taste-tested a future in ultrasound technology, radio, marketing and design. Her love of music and adventure inspired a spontaneous move to Nashville in 2010, and after spending 3 years working in a 911 dispatch center, she landed her first sales job on Music Row. and sets you gently back into the loving arms of Mother Earth. 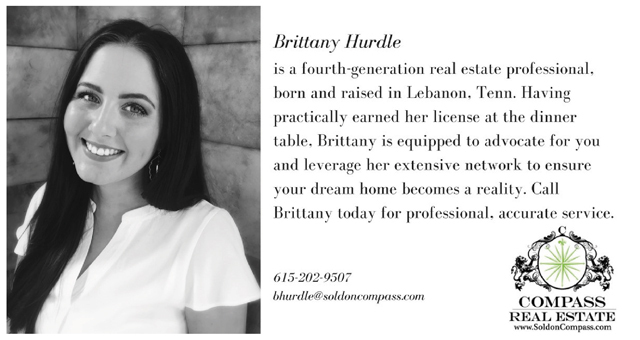 Alexz would love the opportunity to meet with you regarding any real estate or auction related needs you may have in and around the Nashville area. Reach her directly at (605) 999-7179, or by email at Ageyerman@soldoncompass.com.